Clients can get the desktops assembled as per their specific requirements from us. 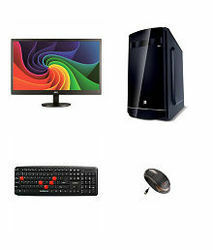 We offer desktop computers that are reasonably priced and have a longer service life. Further, we also provide essential suggestion to our clients for assembling in terms of processor, Ram and GPU cards. These are modular with components that can easily be replaced or upgraded. We are a notable All in One PC Manufacturer, Exporter and Supplier. We are also engaged in importing feature packed All in One PC that is loaded with all the latest advancements. All in One PC, offered with us, is highly appreciated for its high performance and efficiency. We make available All in One PC that is in tune with the latest technologies.